Our Texas certified real estate appraisers provide residential and commercial appraisal services throughout the Houston Heights market for both private use and lending usage. Our goal is to deliver a fast, reliable and comprehensive valuation service that serves our customers’ expectations perfectly. Not only do we complete our reports faster than most other appraisal businesses, we offer some of the lowest fees for appraisal services in the market. We only employ appraisers that are local to the Houston area and familiar with its varying markets. Our staff is capable of performing assignments for residential, commercial or mixed-use properties. If you have a commercial property that needs analysis our staff of Texas Certified General appraisers can provide you a quote based on the assignment details. Whether you need a real estate appraisal report for financial, private use or a legal situations, our appraisal services can be used for almost any real estate valuation needs. Be it homeowners or industry veterans, our promise to you remains the same – to offer a reliable and friendly appraisal service. Should you have any questions or you’re ready to request services, simply call the number on this site or complete the appraisal order form found above. 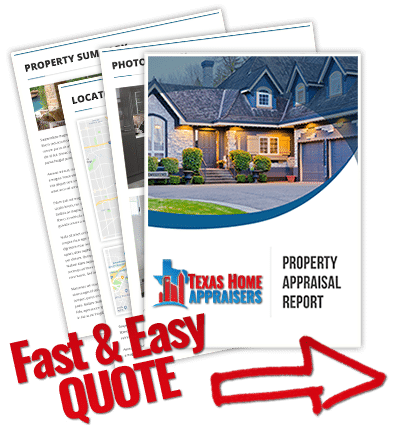 If you require a certified houston home appraisers to complete a quick and accurate appraisal for your home, call the number above today or fill out the easy web quote form. What qualifications does a real estate appraiser have to meet? A real estate appraiser must be licensed or certified through a state agency and is required to meet educational, experience, and examination requirements. Appraising is an apprenticeship and all appraisers must log over 2,000 hours under a sponsor before they can get a license. As an ethics requirement, appraisers must demonstrate competency in their chose geographic area before accepting assignments. Can appraisers use comps from online appraisal sites? Appraisers do not use Zillow, Trulia, Realtor.com, etc. Appraisers pull their data from MLS. Appraisers can also use comps not sold through MLS if they are available, but ample documentation must be provided. Most appraisers are not fans of the online valuation sites due to their misleading and often outdated information. If you’re looking for a better way to ballpark sales data in your area, try searching the local MLS for active and pending listings. How long should an appraiser take when inspecting a property? Once an appraiser is given access to a home, the measurement and inspection portion may take anywhere from thirty minutes to a few hours depending on the size and condition of the home. When the field work is finished, the appraiser completes the report at his office. A narrative report is the most detailed report available and is commonly used by lenders or clients who want or need a great deal of information in an appraisal, while a short form is the exact opposite and is provided to clients who need very little information and just interested in the property value. A short form is an exterior-only inspection of the subject property, therefore, little time is spent at the subject property and most of the appraiser’s work is done from the office. Because most narrative reports provide a substantial amount of in-depth information about the subject property, they can take much longer than any other report. Why are real estate appraisals required? Because much private, corporate, and public wealth lies in real estate, the determination of its value is essential to the economic well-being of society. It is the job of the professional appraiser to determine these values by gathering, analyzing, and applying information pertinent to a property. The appraiser plays a pivotal role in assuring the homeowner feels more secure in their purchase of a new home. Due to the risk involved for borrowers and lenders, the appraiser’s opinion of value reduces the possibility of overpaying or over lending on the purchase of real property.